MONTREAL - Federal officials closely tracked the fallout of an RCMP raid on a First Nations protest against shale-gas exploration in New Brunswick, at one point raising concerns it could spawn another countrywide movement like Idle No More. Members of the Elsipogtog First Nation, who were concerned about the environmental impact of shale-gas development, didn't want energy company SWN Resources to do testing work on their traditional territory. As the situation unfolded, a government official sent an email reporting "growing support of protesters by first nation (sic) communities and other groups across the country." "An 'Idle No More' like movement of protests is reportedly being planned starting tomorrow," wrote Alain Paquet, director of operations for Public Safety Canada. "We will keep you informed through our Situation Reports..."
On its website, the centre says it provides an "all-hazards integrated federal emergency response to events." "Other than the events at Rexton, N.B., so far calls are for peaceful action," the notice said. "Most of the protest activity to date under the Idle No More banner or related environmental or First Nations issues activities have been peaceful." One update noted that the "creators of Idle No More in Lethbridge, AB, said via Twitter that they wasted no time in getting a group together to march down the city's main drag Thursday afternoon." It also noted reports of "small demonstrations in New York City and Washington, D.C. outside the Canadian missions," as well as in Montreal, Ottawa, Winnipeg and Edmonton. Another document outlined the "key messages" for the RCMP when fielding questions about its handling of the New Brunswick blockade, which protesters argued had been heavy-handed. "Our members demonstrated incredible professionalism as they worked to resolve the situation," one bullet point in the document said. "Some in the crowd threw rocks and bottles at them and sprayed them with bear spray. 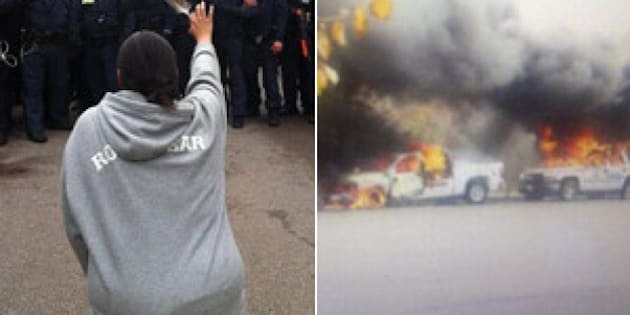 Setting police cars on fire created a dangerous situation for all present and at that point our members were forced to physically confront some in the crowd who refused to obey the law." By Sunday, Oct. 20, three days after the arrests, a government update said "the number of protests continues to decline." "Less than five are planned for today according to the Idle No More website with one protest planned for Saint John, New Brunswick on Monday," the email said. "Canada has to have a better relationship with First Nations people," said Levi-Peters, who ran for the NDP in 2011. "I think Ottawa is misunderstanding First Nations people. And they're getting more educated. I think Ottawa is in a shock because they don't know how to treat them anymore." An email to Public Safety Canada asking whether it is standard procedure to closely track social media, media and RCMP reports drew the following response: "The GOC provides strategic-level coordination on behalf of the Government of Canada in response to an emerging or occurring event affecting the national interest."